Bell and Spurling are Martin Bell and Johnny Spurling. They are probably the most talented duo you are likely to see, with two very soulful and powerful voices which has enabled them to carve out a great career within the music industry. They got together nine years ago to combine their talents and perform at various functions all over the world from Lake Como to Las Vegas. They have a large celebrity following and have performed at parties for the likes of Manchester United footballers to pop stars such as Rod Stewart and Robbie Williams and even Simon Cowell. 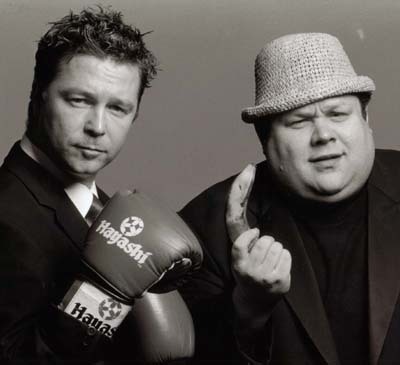 With a unique image that can only be described as chalk and cheese, they have also forged a career in comedy with their quick wit and unbelievable stage presence. They have appeared on every national TV show from GMTV to This Morning and from MTV to News at Ten. They are most famous for their two appearances on Top of the Pops, performing their hit singles "Sven Sven Sven" and "Golden Balls", the two football anthems written about the England manager and of course David Beckham, which became cult status and sold over 300,000 singles, keeping them in the top 40 for over eight weeks. They are now regular guests on various radio shows from Talksport to Capital FM, and are currently piloting their own radio and TV show. They also created two spoof gangster characters "Tommy and Georgy Armless". for the TV show "Costa Del Dosh" which has run for the past eighteen months. The boys continue to travel all over the world performing their live show, which includes various songs from the likes of Marvin Gaye, Elton John, Stevie wonder and Frank Sinatra and not forgetting finishing the evening with their very own hits, which is always well received. This year has seen them tour with Mike Reid, support Madness on their Spanish leg of the tour and perform for Rod Stewart at his private parties. This year they will be singing at events and venues including, The Dorchester, Hilton, Grosvenor and London Palladium. Bell and Spurling's ability to host the evening as well as perform and sing is unique and has worked well for many large corporate events and live functions including TV and radio.